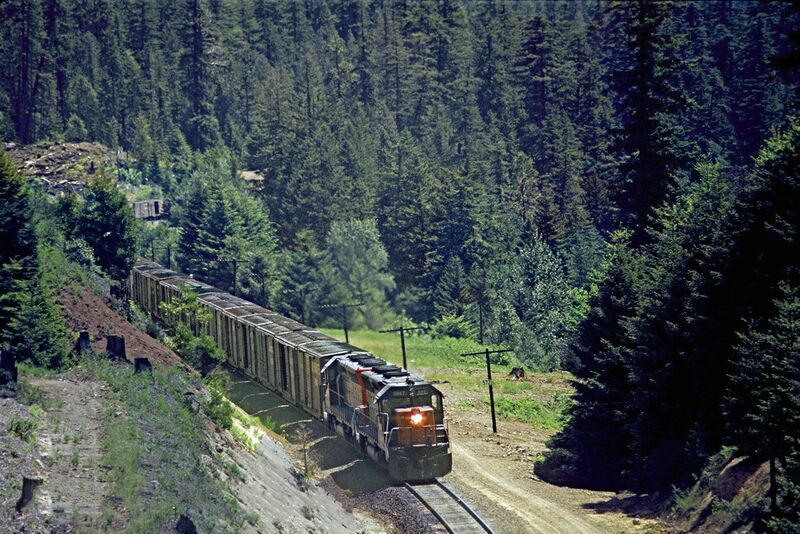 A pair of SD45's are on the point of this SP freight train descending Willamette Pass (elevation 5,128 ft or 1,563 metres) on what is now Union Pacific's Cascade Subdivision. The lead unit dated from March 1968. Willamette Pass is commonly applied to the Southern Pacific's Natron Cut-off but in reality that name is for the State Highway 58 Pass one mile Northeast of the railroad. Pengra Pass is the proper name, some 600ft lower than the highway crossing of the Cascade's. This name honoured the first Surveyor-General of Oregon, Byron J.Pengra who discovered the route in 1865.
see pg 287 The Southern Pacific in Oregon by Ed Austin & Tom Dill.